It hasn’t been windy here in a long time. Or at least, I haven’t noticed the wind. Wind is a funny thing. Have you ever tried to describe the rapid movement of air to a child, as wind? What’s blowing? Well, it’s air. You can’t see it but it’s there and it’s moving. It’s a beautiful day outside. Sunny, bright. Absent the bowing of a branch, you’d merely see a tree against bright blue sky. But if you walked out there, you’d feel it. You’d know it’s icy. What’s that they say? Winds of change, right? It’s been four full days since I added some bright blue to my otherwise, nondescript hair, again. It’s been blown all about. Until someone makes a comment, I often forget, it’s there. But the reminders come from strangers. I cannot count them anymore. They mention my hair and I impart the reason for it. That part of my heart that is wrapped around autism is, like the wind, usually invisible to the outside world. 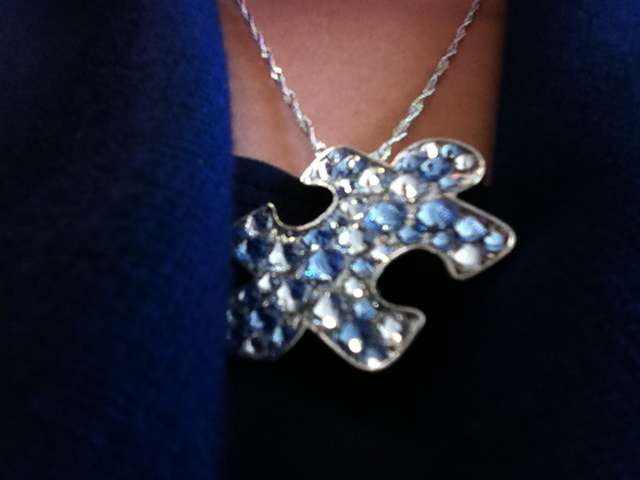 Now, the icy blue flecks of hair, the beautiful puzzle piece pendant I acquired, and my voice, work together to open my heart to all who comment or ask. In a year, I’d forgotten the importance of my little corner of the world. How abysmally self-centered of me to believe, even for a second, that the world does not need us to continue to spread the word of what autism is, how it affects our daily lives, what it’s like. The potential for interest and understanding that awaits us opening our hearts is there if we let it be. In the past year, I’d come to think I knew all the same people and that there were not enough “new” people in my life to justify continuing down the road of “awareness” but for consistency, for my son, I did it again. I was so wrong about who knows what. I have realized now, that I see an average of 20-25 people a day who are ‘new’ to me. People at my coffee shop, at my son’s school, in my office, at the mall, buying a Happy Meal, getting gasoline, at the grocery store. All of them start the conversation with my hair. 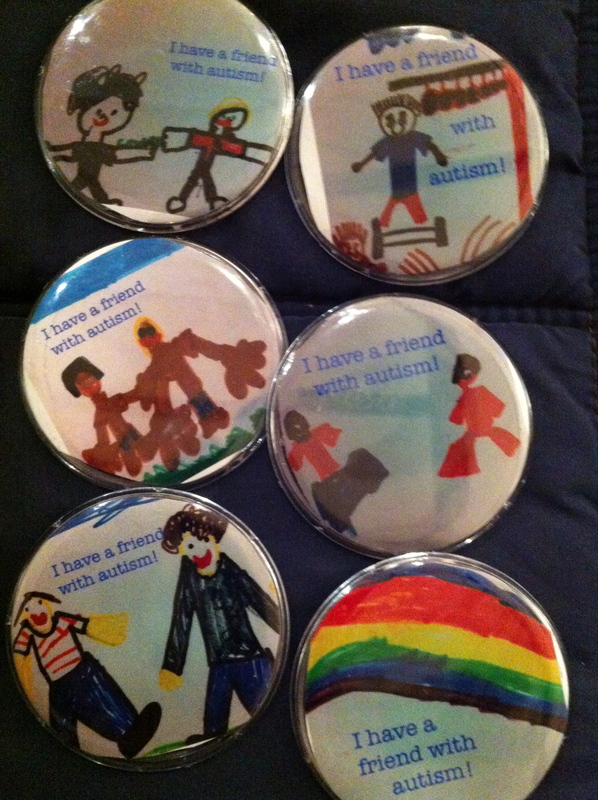 All have left those conversations knowing a little more about autism. Knowing something new – what to look for – what’s different, the same – what’s available to diagnose, to aid, and how I have come to live the respect and love for a child with autism. I was sad when I last wrote here because we’re going through a period of change. Change happens all the time for everyone. It’s part of life. Some appear to accept it easier than others. 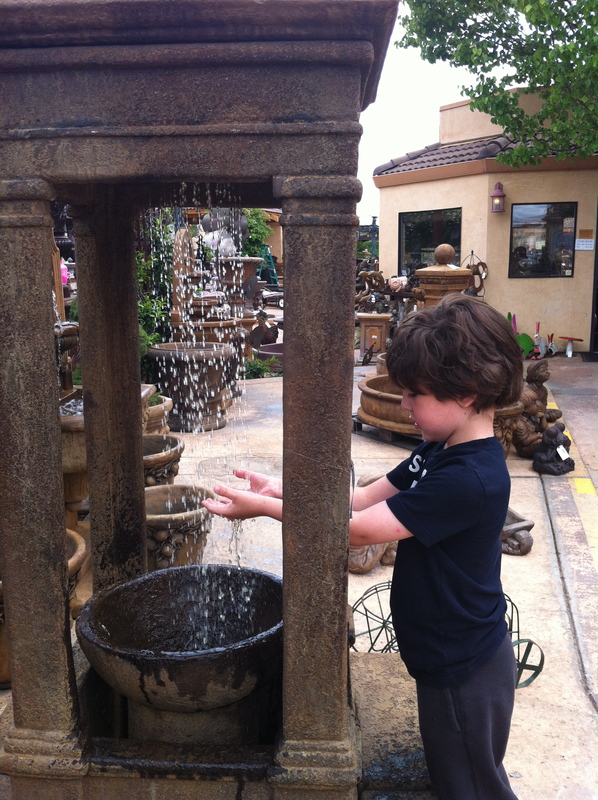 Autism lends itself to a deep love of familiarity and routine. It calms the nerves, lessens the anxiety. For me too, routine is soothing and adding a little dose of blue to my hair would be change. I need routine, to remember all I have to do for my son, to keep his meds in the right dose at the right time, to get him to bed so he’s not overtired, to wake him in time for school… don’t rock the boat. But as time passes, change comes with growth. Size 6 has become size 7, 12.5 shoes are now 13.5 or 1’s. Yes, he’s gained about six pounds and grown over an inch and a quarter. Medication were changed. Finding the right fit in clothes for us also means finding the right fit of medication. We’ve found both now. The rather large chasm in the road has sealed itself, and we’ve walked right over it as though it was a mere bump along our path. The most beautiful part of the view now is the detail with which my son is now seeing the world. Between his birth and two weeks ago, my son had not so much as ever mentioned a smell in his life. You will see tons of old posts where I say he is “hyposensitive” to smell. But now? Yesterday, as we merged onto the freeway, behind a diesel truck, he said, “Something smells bad, Mommy!” For the first time, I got to explain that the smell was diesel fuel. Was he hyposensitive or was there a loss of connection between the smell and the communication of his perception of the smell? Either way, it’s connecting now. And that’s huge. He’s giving me sharper images. It’s me that ends up learning. 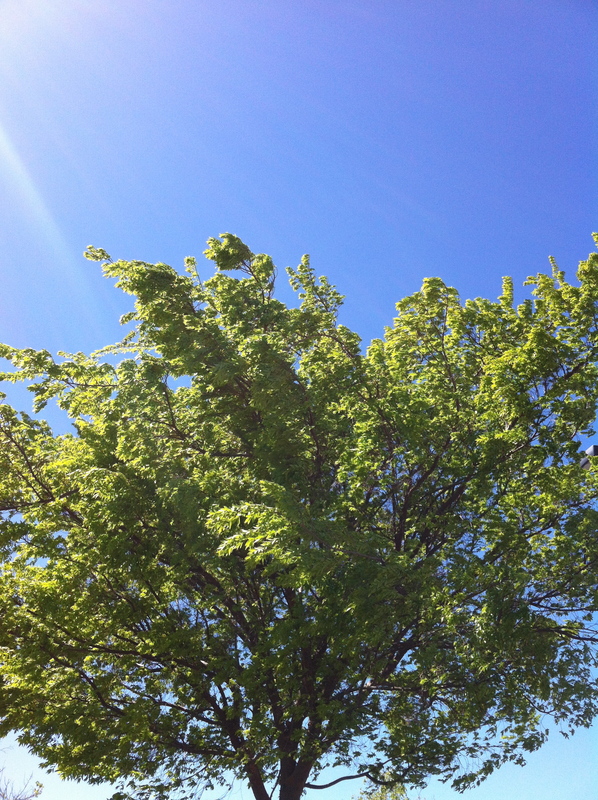 I can see the branches bend as the wind blows, not just a picture of a tree and clear skies. I think what I’ve learned, most of all in the last week, is that I’ll never be done learning and when I am? It’ll be because I refused to open my eyes to the possibility of change. The clouds have been more than intermittent. Some days, I can’t see the sun at all. It rains off and on. The windshield on my car is dirty and full of spots that obscure my vision. I can’t wash them off with a spray of washer fluid because that is broken on my car. So when I try to wash away the dirt, it smears, and I hear that scraping sound that sends chills down my spine like fingers on a chalkboard. One minute I’m freezing. The next it’s hot. With the humidity from the spring rains, the car smells like urine. Yes, you read that right. That’s what happens when there is a seizure. I’ve scrubbed the floor but the smell has not gone away. It’s okay when it’s not stuffy outside or hot. But when it’s either of those, which is most of the time these days, then I’m treated to a reminder about differences. Our fairly new senior tutor announced that she believes she’s mastered compliance with my son, this week. This means she believes he is listening to her instructions. She offered to try to generalize this feat in different environments. Ride around with us on errands to check that he listens to her other than in the environment he’s used to “complying” in. I put her off it, saying we had no errands to run. The reality is that I don’t want her in my car, smelling urine as we ride around in the humidity and heat. And she is our tutor. She knows and understands. But regardless of “knowing” and “understanding”, how can I offer a ride to anyone when my vehicle smells like urine, right? It’s a bit depressing. Long after ideas, plans, and goals are discussed and cerebral loftiness is praised and honored, my carpet still tells a different story. The parts no one wants to discuss. The stains that don’t go away. I could pretend our autism is just the beauty in my son’s eyelashes, his gentle demeanor, his sweet smile and kindness. But the reality is that it’s just as much the incontinence, the seizures, the inappropriate screaming he does when he is excited by a game, the delays or absences in a response back when I talk to him. It’s really all of it. And lately, the clouds obscure my skies. The windshield of my mind is not clear and I cannot wash away the parts I don’t want to see. I’m not writing a fairy tale. Once upon a time, I started this blog with some ridiculous idea that I could bring awareness to people who don’t know about autism. That was at a time when autism, as I knew it, was a fledgling, sprout, fresh from a seed, I didn’t recognize. When one Googles autism, you get nearly 12 million results in the blink of an eye. Who is going to come here to get “aware”? I’ve been writing for two years. I’ve been criticized, praised, sympathized with, empathized with, pitied, hated and ignored. Everyone affected by autism, has an opinion. Every opinion is different, just as every autism diagnosis is different. I’m different now too. I think it will always be important to spread awareness to those who have no knowledge of autism. I find that still every day of every year. There are millions of people who have no clue what autism is or how it affects those who have it or live with it. There are people who are rude, uncaring, caring, concerned, misinformed, trying to be helpful, affected by it but in different ways from me, and there’s me and my son. If just one more person nurtures awareness like a seedling and gives that seedling respect it will grow into understanding instead of hate. One more ally – one less enemy. I’m tired. Tired of petty fights within a community that is supposed to be united. Tired of hearing how we should view organizations that purport to represent those we love with autism. Tired of having my identity be that chick who talks about autism all the time. Spring Break is over. My son returns to school. What have I learned this Spring Break? Nothing. My son is still different than all the other kids. He doesn’t talk when spoken to. When he does talk, he’s obsessing on a subject in which only he shows interest. He’s playing with toys labeled for 9-36 month old children. It’s no wonder I cannot throw away or give away old toys. He’s still trying to figure out the meaning for the ones he received six years ago. I love him. He loves me. We live a different life. One currently involving a lot of blood draws, medication changes, regressive behavior, fear for me of what the future holds. We all go through ups and downs, sunny weather and chilly days. 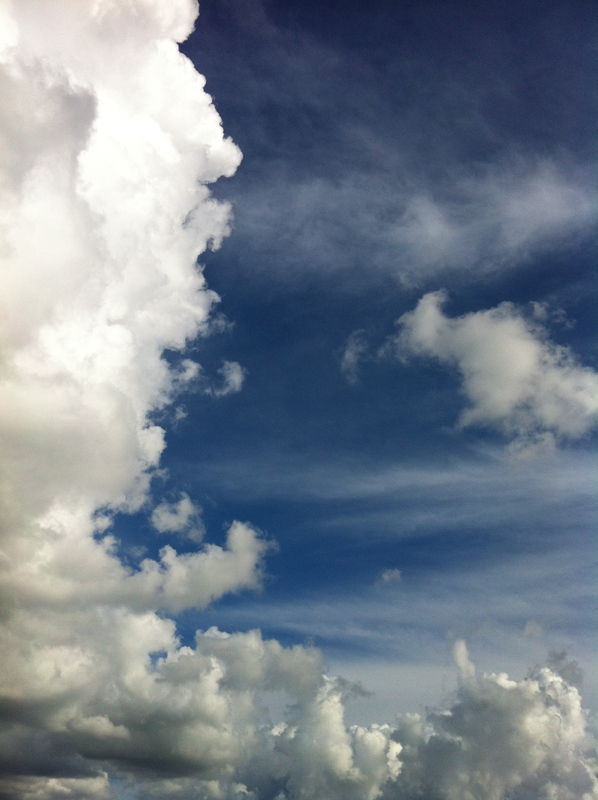 As we head into the rainy month of Autism Awareness, I see a lot of clouds. But I have no choice but to look past all of that, and with my blue lightbulbs and blue hair, share what I know to get a new mom, a new family, early intervention, to recognize signs and find resources in real life and not here in internet space, because regardless of how I feel, most people still need the news of what autism is and how to help children get the therapies, resources, and education to which they are entitled to make their lives easier. It still needs doing and I’m one of the ones destined to do it. So I will be blue this month, just so you know. In early January, the results were back. There was increased abnormal activity in the left temporal lobe. The report called it “stable abnormal activity” which seemed just the epitome of ironic phrases to me. The first EEG showed left temporal lobe seizures. The second EEG showed no seizures on the left. The most recent, in January, showed a reemergence of left temporal lobe seizures again. Since his seizures are “silent”, I’m left assessing things as an “outsider”. I see things that I can chalk up as silly behavior or as warning signs. Underlying it all, I have this constant fear over what makes him do some of the things he does. When he laughs hysterically, with no external cue, or when I must repeat the same question over fifteen minutes with no response, I worry whether he is having a seizure or how extensive the damage from it may be. But even if I did know, so what? It’s not like I can reach into the medicine cabinet and give him a bandaid to stop or fix it. 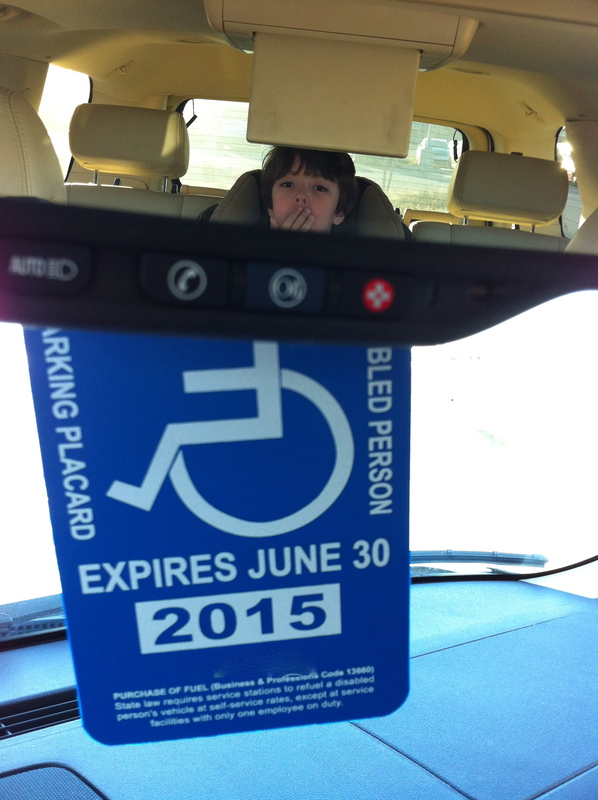 I deeply love a child whose level of disability rises and falls unpredictably. One minute he’s winning the class spelling bee, playing with friends, hugging his mama. The next, he is completely nonresponsive to everyone, or laughing hysterically like he’s being tickled to death. At minimum, I’m on yellow alert. This had been his strength. When he started the school year, he tested in the highest five percent of all kids who took the test, across the country. Now? Not even close. I call the ABA staff. The new senior tutor agrees to be the one who supervises the retest. He takes it over. He doesn’t do much better. The problems are quite defined. There’s just no real answer. No solution – no fix. He’s crashing. I’m dialing. The neurologist cuts a dose of one med, orders another blood draw to check the levels of medication in his blood. His ABA team talks -formulates a plan. But I’m tired. There’s always a “plan”. I want answers. I want it fixed. Too bad for both of us. And lately, I’ve seen faces, relatives, acquaintances, who give me looks of pity. I’d rather they despised me than pitied me. So, I just have to take it. From both ends. I call, let the “team” speculate and experiment on my son… and I have to accept that. I’ve never accepted that. I doubt I ever will. I know there has to be a way and someday it will be found for someone. I buy reading comprehension books. He reads a paragraph and responds to the multiple choice questions perfectly without a prompt. I have him do an online spelling test. He gets 100 percent on his first try. Then, we sit back to read “Owl at Home”. The first story is about winter knocking at Owl’s door. He has no clue what “winter” is. He’s nearly 7 years old. Even after I explain it to him, he tells me you wear shorts in the winter. After five minutes, he is gone, though sitting right next to me. I tell him to go play. I head back to buy new materials to teach him about the seasons. I answered, “Autism is not just about things being hard – it makes you who you are – you’re sweet, and good, and everyone loves you, and part of all that good is autism too.” He was quiet, and gave me his tilt of the head, as though he was weighing what I said. Then, his lips began to move with no words. He started to echo. And before I knew it, he was gone again- even before his body got up and he ran off to play. 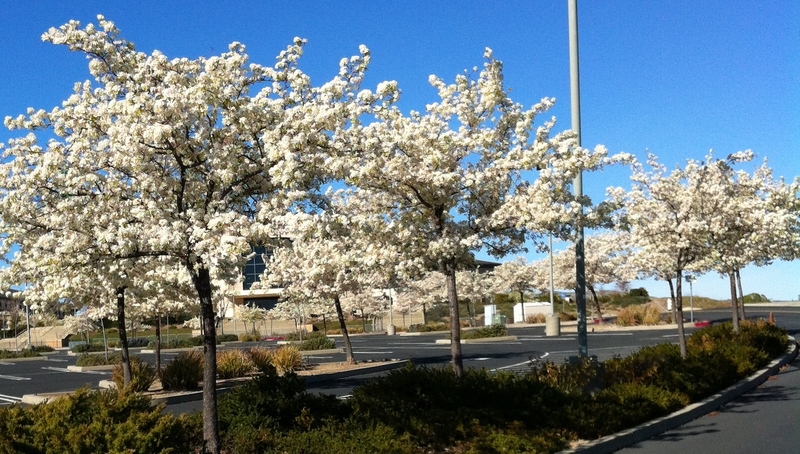 Though the calendar says mid-March, trees are blossoming, daffodils are dotting the landscape, and pansies have been potted in outdoor containers all over the shopping centers in Northern California. Temperatures have magically climbed into the upper 70’s. 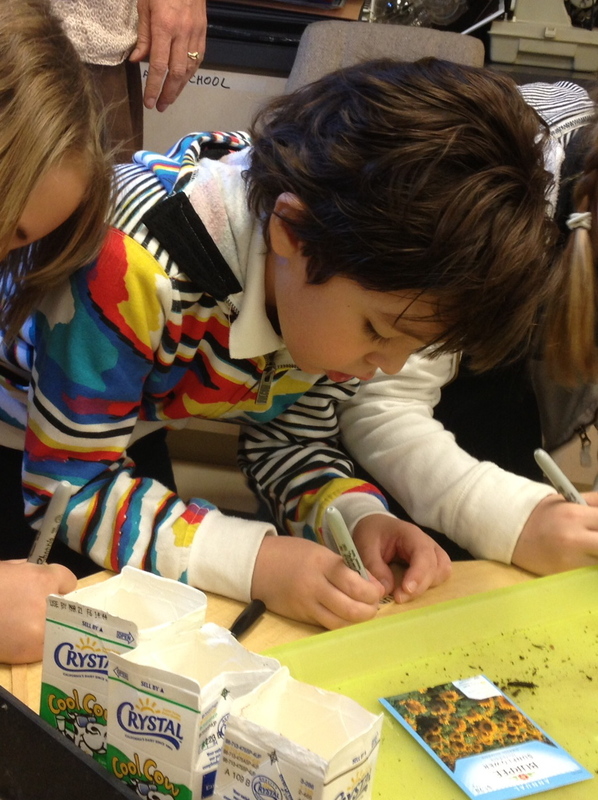 Children in Mrs. B’s first grade class are planting and cultivating the seeds in the class garden. 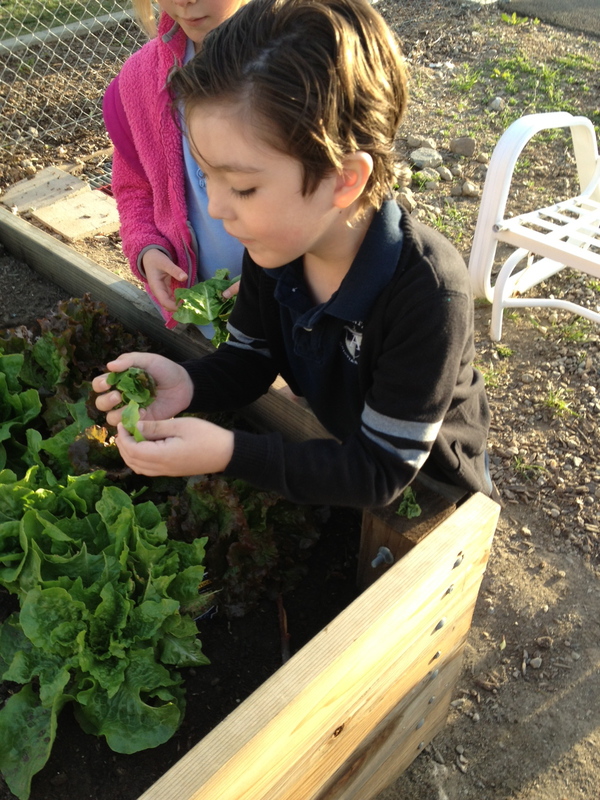 Even the little boy, who was afraid of seeds at the beginning of the school year, now plants them, and picks lettuce growing in the school garden to feed the class turtle. 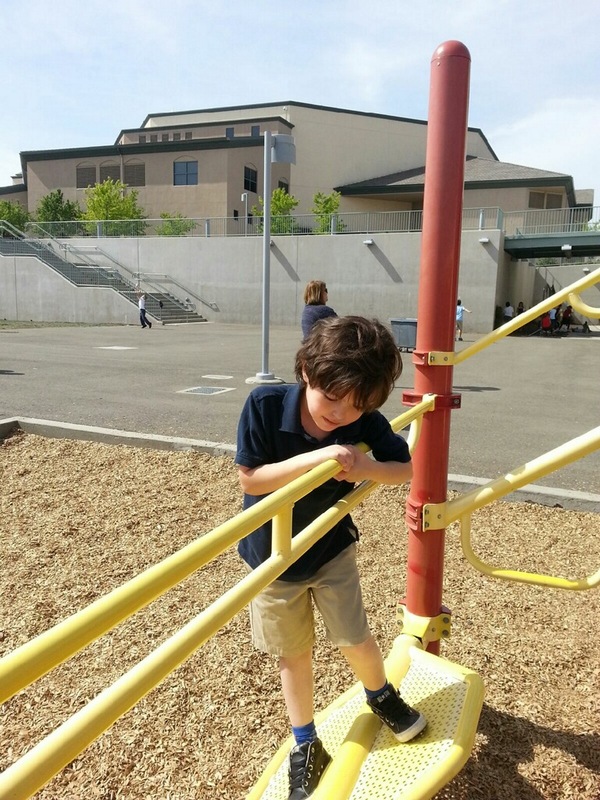 With the emergence of warmer weather have come glorious, outdoor recesses. Time for children to play together. The little boy, who echos and laughs to himself, year round, manages a smile every day on that playground, even if no one is around to share it. He has a “best friend”, a sweet girl, who enjoys playing with him. But beyond that special bond, he’s begun playing with a few of the boys. He climbs the monkey bars and shoots hoops. More importantly, whatever he does, he’s happy. 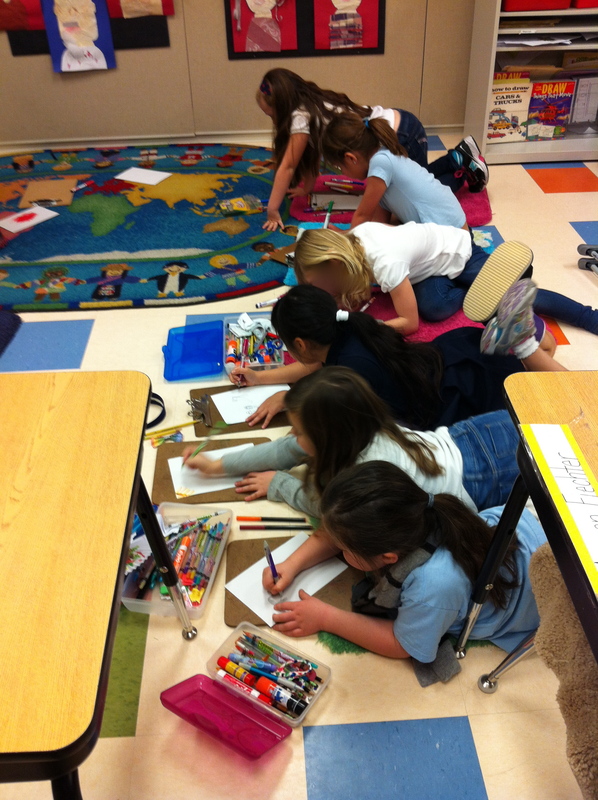 The carefree pre-spring days of first grade. A time of sweet innocence and warmth. A time when everyone is considered a friend. Just before Daylight Savings Time, this little boy was invited to a birthday party by another boy in his class. This was the first time, in the first year with these new peers at a new school, that he received such an invitation. Bittersweet that. But the birthday boy was new too. He started in the class late in the year, and he was always willing to play with the different little boy. The birthday boy asked his mom to invite the little boy. The little boy was excited. He’d be going to a place where children bounce on big slides. The party was the same day that the class was told about the boy’s autism, after school, on a Friday night. While there, at first, he played alone happily. Then, one or two boys would pass by, play alongside him a few minutes, and move on. 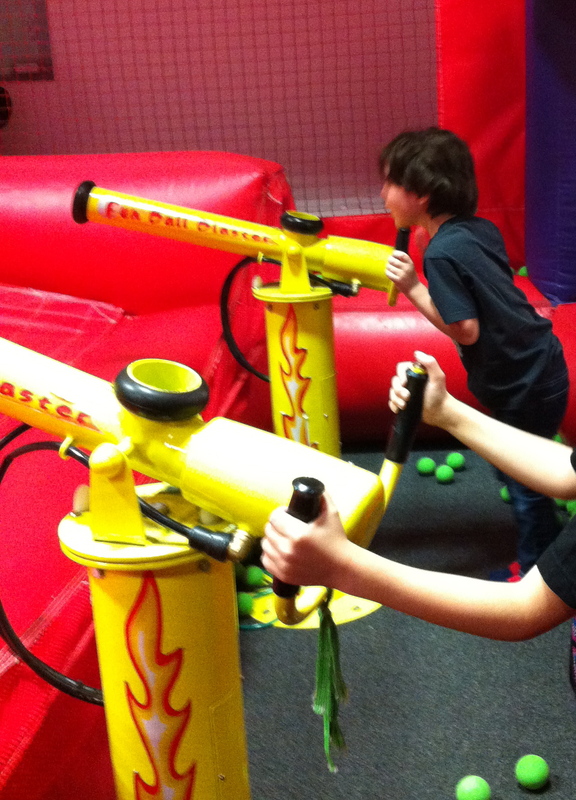 They would cheer encouragement to the little boy to go down a slide, or to shoot a nerf gun. They supported him. They were nice. And the little boy smiled and laughed. The party was a success. At home, the little boy was watching his mama, with interest, as she had begun reading some books. The little boy saw the books were about a boy named “Harry Potter”. He saw his mommy watching movies about this boy, too. The little boy was mesmerized when he saw “Harry Potter” using what he learned was a “wand”. The little boy was captivated by the wand. The mommy found it cute and endearing. “Is Harry Potter a good guy or a bad guy?” he asked one day. The mommy told him that Harry Potter was a very, good guy. Now and then, the mommy would find the little boy with the wand, practicing, calling out, “Expelliarmus!” or “Petrificus Totalus!” The mommy was amazed at how fast the little boy picked up such difficult pronunciations, but then the mommy, who was very busy, did not think anything more about it. Back at school, the little boy’s tutors would report to the mommy that the little boy was doing well at recess, playing basketball, playing on the swings, or monkey bars, with a couple of kids. Mom was happy with this news. Any peer play is sacrosanct. One day, the mommy stood in the bright sun, waiting to pick up her little boy after school. After a few minutes, he came running over to her, as he did every day, his cheeks flushed and his hands up to his ears, in anticipation of heading into the parking lot, to face his fear of sounds while getting in the car. The tutor, though, this time, held him back to tell the mommy a story. At recess, it seems, something happened. The little boy found a twig on the playground. He picked it up. Without a word from anyone, the twig became his wand. His best friend picked up a twig. Immediately, it transformed to a wand, as well. And with a few magical waves, the little boy taught the little girl some “spells”. Soon, the little boy, who did not talk much, had a group of boys and girls, holding wands, casting spells and playing together. And the little boy, who took it all to heart, assigned the roles of good guy and bad guy to each. And so, on the playground, as the flowers bloomed around them, so did the little boy. The first graders played magically for over a half hour, imaginatively, with no instruction, no prompting and no interference from adults. The little boy was their leader, having started it all. Who says wands are pretend? Those twiggy wands conjured up some pretty special magic that day. Thank you J.K. Rowling. I doubt very much you knew that your books would reach a six year old little boy with autism, like this. Just so you know, Harry Potter is still casting his spells and by doing so, he’s giving one little boy some very pleasant future memories. It was at the back of my mind, only because I shooed it there. Go, go on. It’s just a task, like laundry or making the bed. Another task. The alarm was set on my phone. I knew it would be done as scheduled. No need to think about it. And so, I set aside the papers. I went about my business, willing it out of my mind. Nevertheless, the day arrived. I didn’t need to set the alarm, because, despite my attempts, the issue never left me alone. Wednesday at 3:50 p.m. was the appointed time. No big deal, I tried to convince myself. It was a busy day. The time approached oddly. One moment, when the thought crossed my mind, it seemed an eternity before I would go. The next moment, I was in the car, headed to face it. Papers in hand, I entered the building. Even this late in the afternoon, chairs were filled and a long line stretched down the left side of a two-sided line. The right side was empty. At the front of both lines was a desk framed with a cubicle type divider and lined with a counter. One woman sat beneath the depressing florescent lights. She was asking questions of a mother, and what appeared to be, her teenage son. English was the second language. All I could make of it was much confusion concerning their transaction. Before me to the right, on the counter, sat a lopsided, propped up sign with the words, “Appointment Line”, all in caps, staring at me. Yet, there was only one person on the other side of the counter, and she was busy translating the other transaction. I hesitated over where to go, looking to the long line to my left. My appointment was scheduled to happen in two minutes. I chose the empty line. I waited. The two minutes passed. Then four. Then seven. Finally, the woman had completed her task with the two people. She looked annoyed and tired. Nevertheless, she put on a smile as she looked toward me. I asked her tentatively if “this” was the line for appointments. “Yes,” she said kindly, and despite the scowling, angry looks from the crowd to my left, she took my papers from me next. She gave me a ticket and told me to wait for my number to be called. I walked away. The windows were set up so that they were in lines down one row and then, at a right angle around a corner. Before I had decided where to sit and wait, my number was called over a speaker to Window 7. I approached with my number tag and papers. Another cubicle. Another counter. Another woman. Without saying a word, she took the papers and scanned them. I was quiet. After reading and rifling through, she handed me back the doctor’s letter. “You may keep this one for your file,” she said as she handed it back to me, expressionless. She moved toward a drawer and asked, “Is it for a permanent placard then?” “Yes,” I said softly, and, in that moment, the tears formed and welled up in my eyes. Ridiculous, I told myself. Why must you be such a drama queen?! This changes nothing. It means nothing more or less than before. You are just providing another measure of safety for your son. But it was too late. She saw my eyes. I looked away. “He’s only six years old,” I told her, quietly, looking at the doctor’s note I had folded back to the size that it came in the envelope. “I never thought I would see his name on a paper like this,” My voice trailed off. Even, the words implied I was unhappy with my son. Yet nothing could be further from the truth. I wiped my eyes with the sleeve of my black wool coat. She nodded sympathetically. Stop it! I wanted to yell at her. The last thing I need is your pity! You have no idea how amazing my son is. You have no idea. She opened a large white envelope. Taking a paper she printed fresh from her printer, she placed it inside the envelope with my son’s name and address appearing through the clear plastic window, like an ordinary utility bill. The solid blue, plastic hanger that was the placard was inside the envelope. It peeked out from within, shiny blue, scratch free, with the universal symbol and white lettering clearly visible within. “You must place this, (indicating the paper she had just put inside the envelope) in the window whenever you park your car. Place the placard on the rear view mirror. You must remove the placard again before driving.” The tone of her instruction was the same, monotonous speech I heard from flight attendants giving the fasten seat belt instructions. She knew nothing of what feelings were churning inside me as she droned on, giving the speech that she’d clearly done hundreds of times before I stood here. Or perhaps she knew how I might feel and had disconnected from it so long ago that it didn’t cross her mind anymore. Looking at the envelope, while listening to her instructions, I was struck by the number of mixed feelings I had reeling through my head. There was relief that my little boy would now be safer, with less walking distance to dart in crowded parking lots: numbness at the realization that my son was now intertwined with the blue symbol I’d never really connected him to before: anger at myself for the selfishness of feeling sad: guilt at possessing the symbol which I thought belonged only to people unable to walk: more anger at myself for knowing my son has an invisible disability, yet still, stupidly feeling that only a visible disability justified holding this placard. She handed me the envelope with a piteous look. Anger flushed my cheeks which felt scratchy dry from where I’d wiped my sleeve moments before. Outside the building, I could hear birds tweeting. The sun shone brightly. It was spring in the middle of winter. I walked to the car, still jostling with the mixed emotions. Seated behind the wheel, I opened the envelope. I took out the paper and read my son’s full name. And the tears flowed again, despite shameful anger at myself. Looking in the rear view mirror, I wiped away the evidence once more and drove to pick up my little boy. I had never met the woman who was going to give the presentation to the class. I saw the Power Point slides and the text that was intended to go with each slide about a month ago. I had redlined it. “No, don’t say that! This is not my son. Insert this,” I thought, as I marked through each page. I did not know if any of the changes were made. It was out of my control. And so I sat on pins and needles at the back of the classroom. The desks had been pushed closely together toward the middle of the room. The perimeter was opened up. 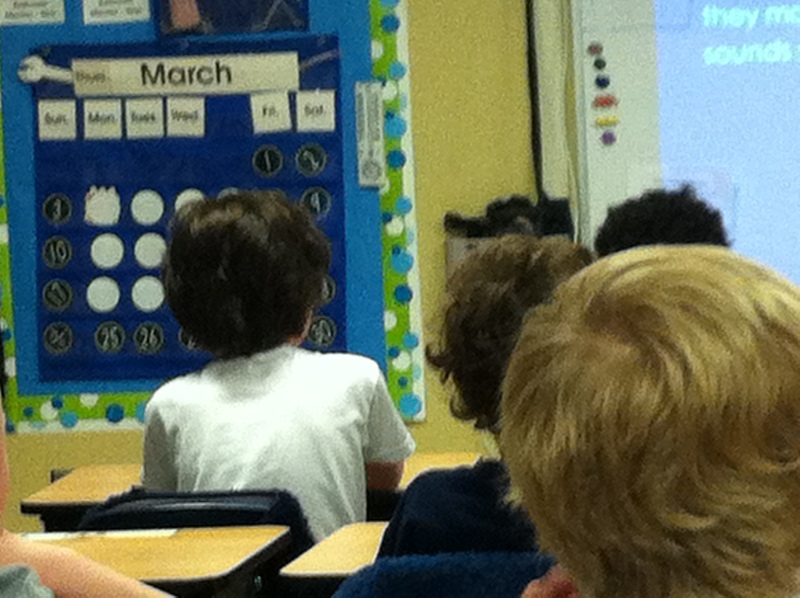 The children from the other first grade class, next door, had carried their chairs into my son’s class. In groups of 2, 3 and 4 they sat on the ends of each row. The Vice Principal of the school had popped in to observe. Both first grade teachers were present. 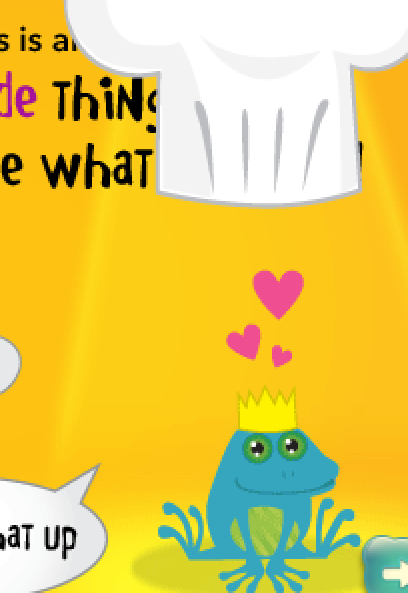 I looked at my son. He was in his white t-shirt, his trademark look in play, the tilt of the head, eyes off to one side, smiling. 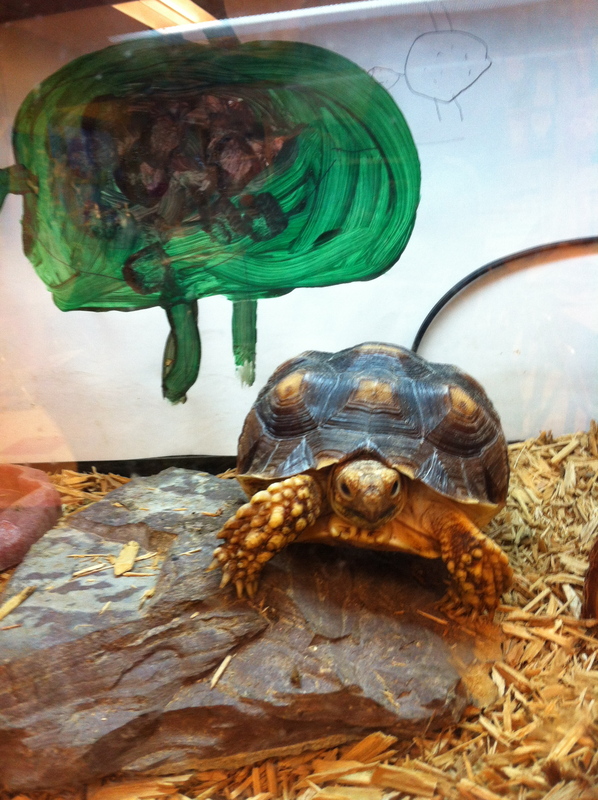 He was softly talking about the class turtle, a favorite subject of his. I was overwhelmed. All of this was to increase understanding amongst his classmates, and potentially, his classmates for next year. This was all organized for my son by his teacher and his ABA providers. But from the talk in the office, the school officials were all well aware of what was happening today in the first grade. The class was learning about autism. 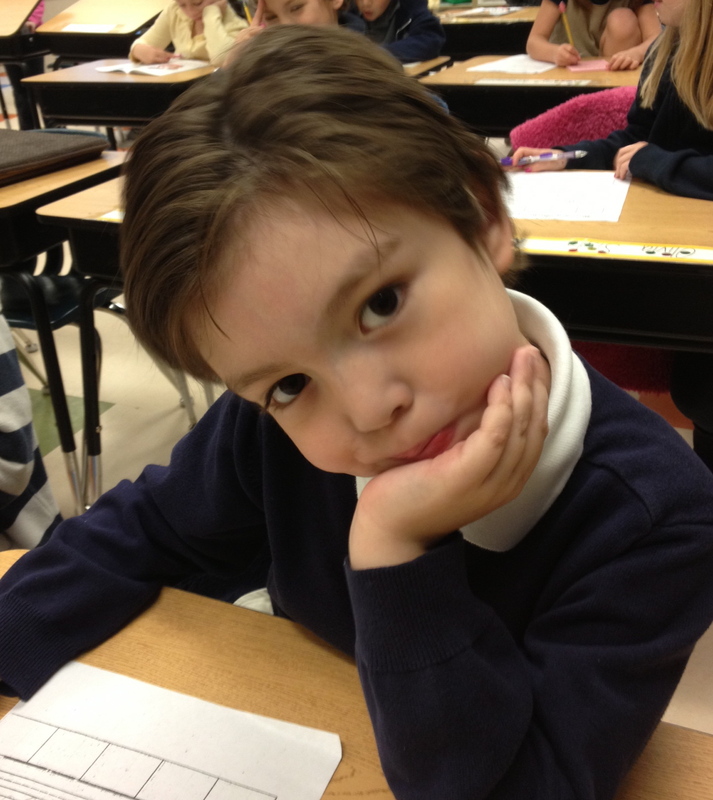 It was time to explain why my son was different and how those differences are not for teasing, or isolating or ignoring. 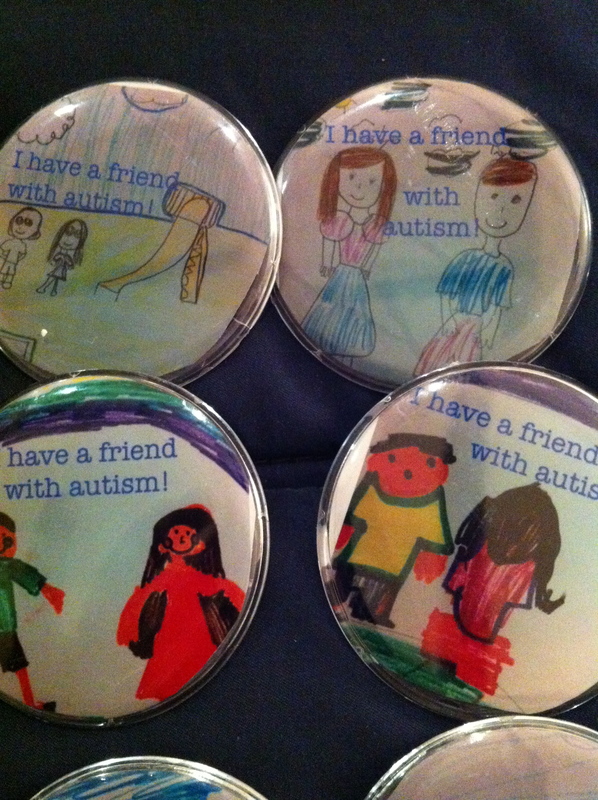 Everything was done in a way to encourage friendship, to teach the children how to be a good friend to someone with autism. To play with someone with autism and to accept that he might not respond the way other kids do was a theme. There was emphasis that even though my son might not be able to express it, he will be happy and glad for the friendships that come. The presenter was an assistant director from the company that provides my son his one-on-one ABA classroom aides. She was lively and kind. Positive and approachable. She talked about special things my son could do and one of the kids raised a hand and mentioned how they knew my son could spell because he was second in the spelling bee! She took questions after the presentation was over. The questions were not so much questions as statements about the kids themselves. Some of them told stories about how some noises upset them, how they were anxious and scared in new situations too, like the first time a couple of them slept in bunk beds away from home or heard a fire drill bell. One boy asked if there was a cure for autism. The answer by the presenter was that it was no different that being born with blue eyes. She carefully skirted the word “cure” altogether. My son’s teacher asked the children to raise their hands to thank the presenter and when they did, to tell the class one thing the child learned from the presentation. Most said they learned how children with autism can be extra sensitive to sound. 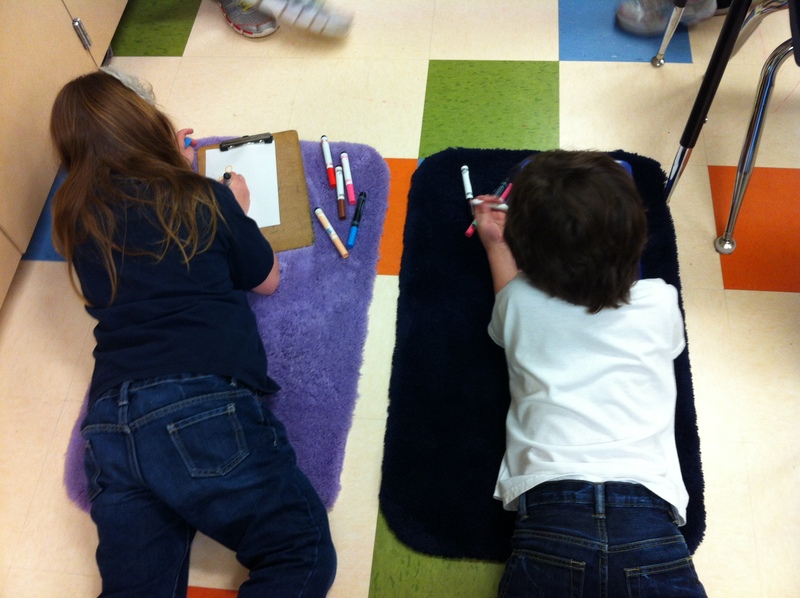 Others said they learned that children with autism might not talk like the rest of the class. I was touched by all this effort for my son. I told him before it began, what was going to happen. I don’t know whether he knew or understood that this effort was for him. He has not spoken about it at all. He seemed to pay the same attention to the program that I normally see him pay attention to anything else in that classroom. Some of the time, he appeared to be listening. Most of the time, he appeared to be elsewhere. 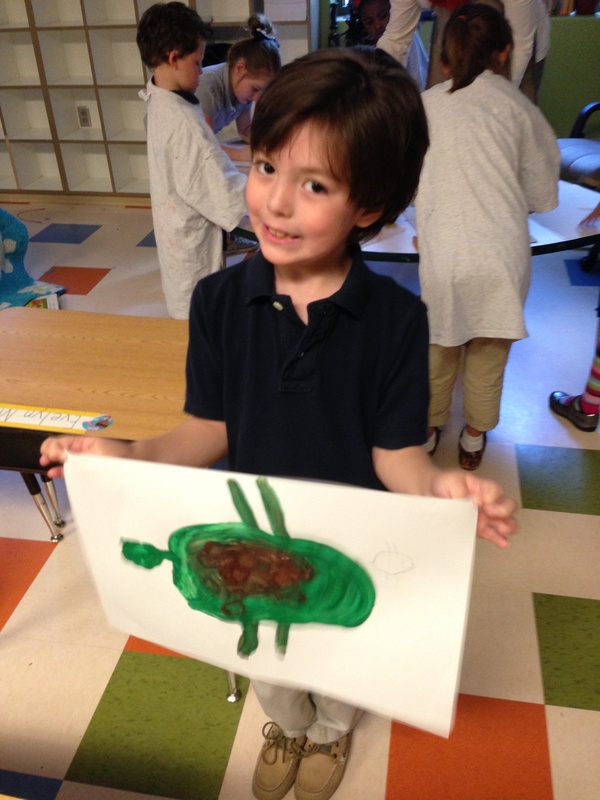 He did have a couple quiet but clear verbal outbursts of echolalia, related to his class turtle during the program. My son’s teacher asked at the end of the program what the children could do to be a good friend to my son. She encouraged them to play with anyone on the playground who was alone. A few of the kids said they would play with my son. I have no idea how much of that was true, or they felt it was expected on their part. He never looked at anyone who spoke about him but he was always smiling. For my part, the day before the program occurred, I offered an idea. 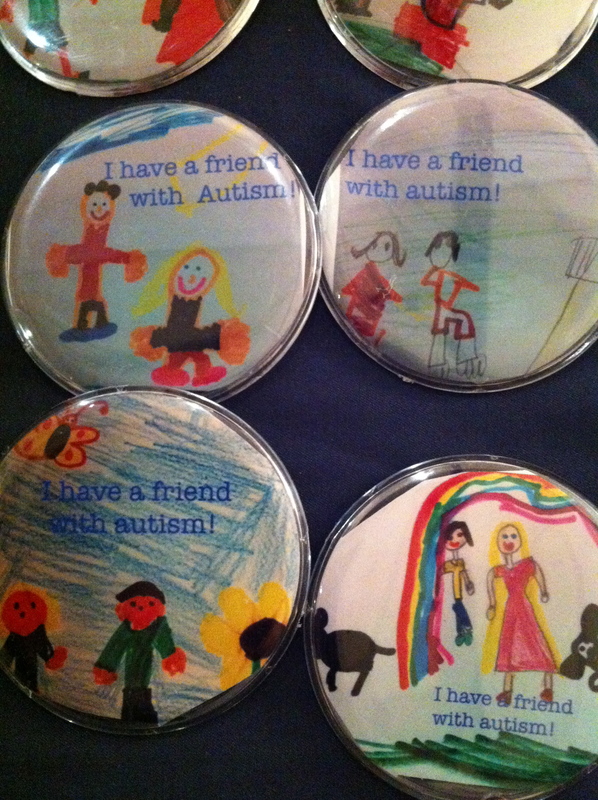 I told my son’s teacher that if she had each of the children draw a picture after the program, I would add the text, “I have a friend with autism” to the pictures and turn them all into buttons the kids could wear. They would wear their own artwork and support a friendship with my son. She agreed. Once finished, I will insert them in plastic bags, tie them together with a sugar cookie shaped like a puzzle piece and pass them out to the class. I hope the buttons stick with them for a long time. Someday, they will meet another person with autism. I hope it is something they will associate with a happy feeling and accept and embrace without question. This program did a lot to foster that. I will alway remember and be grateful to everyone who had a part in it. Some people are just good by nature. We are lucky to be surrounded by them. In a world of hurt, arguing and pain, it is nice to have such a loving supportive community surrounding my child.